A couple gets their hands dirty in Brooklyn by rehabilitating a 19th-century tenement to reveal decades of layers and scores of possibilities. 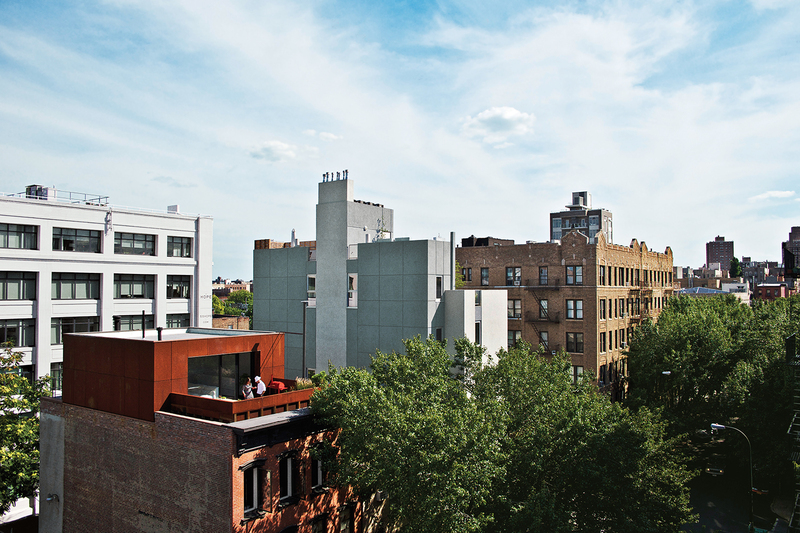 Alex Gil and Claudia DeSimio created a duplex in an apartment building where they’d been renting for years in Brooklyn, New York, and set to work gutting the interior and adding a new rooftop addition clad in panels of Cor-Ten steel. They established that the building was constructed no later than 1887, under the city’s oldest tenement law, and therefore could legally do without an elevator and other modern adjustments. 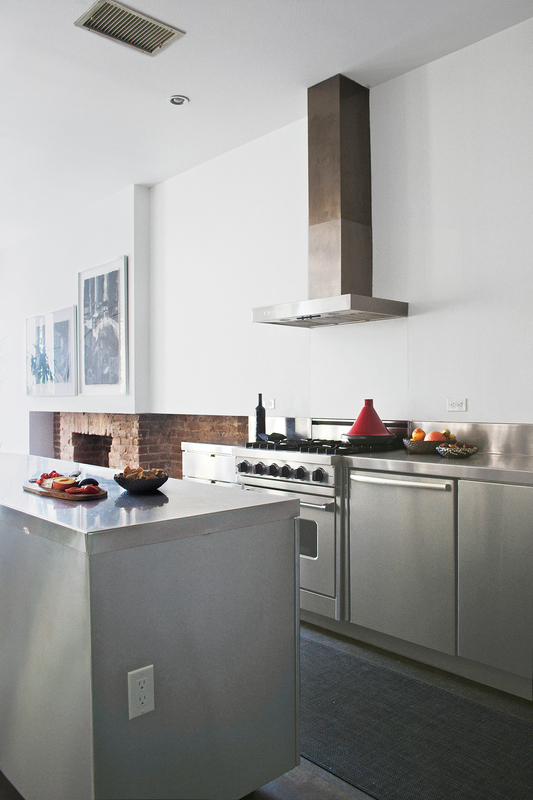 The pair reconfigured the space inside the 2,000-square-foot duplex, creating one open area to hold a monolithic “wedge core” to house the staircase, installing a new stainless-steel kitchen, and placing a dining table designed by Gil and fabricated by Artistic Wood Crafts. “The older the building, the more you can adhere to older codes, which gives you more liberty,” says Gil, who heads the architecture firm Spacecutter. The bedroom is tucked in the back of the residence and doesn’t receive a lot of natural light. The couple emphasized the coziness of the space by painting the walls in Space Black from Benjamin Moore and selecting an oversize artwork, Flotar, 2011, by Christian Curiel. The bed is a Louis XV–style reproduction, approximately from the 1950s, that Gil and DeSimio found on eBay. “What was interesting for me was the fun artifact stuff, like finding a pair of sewing scissors and buttons and needles in the floor,” says DiSimio. The residence’s two bathrooms present distinct material identities: In the main bathroom, located on the lower level near the couple’s bedroom, a custom stainless-steel bathtub designed by Gil contrasts with a wall clad in silver travertine. In the upper-level bathroom, tiles painstakingly fired by DeSimio cover the walls and ceiling. The living room-office, part of the new rooftop addition, has a Forever 715 sofa by Vibieffe and a rug the couple purchased in Morocco. The custom swing double doors feature a thermally broken aluminum frame and insulated glass. 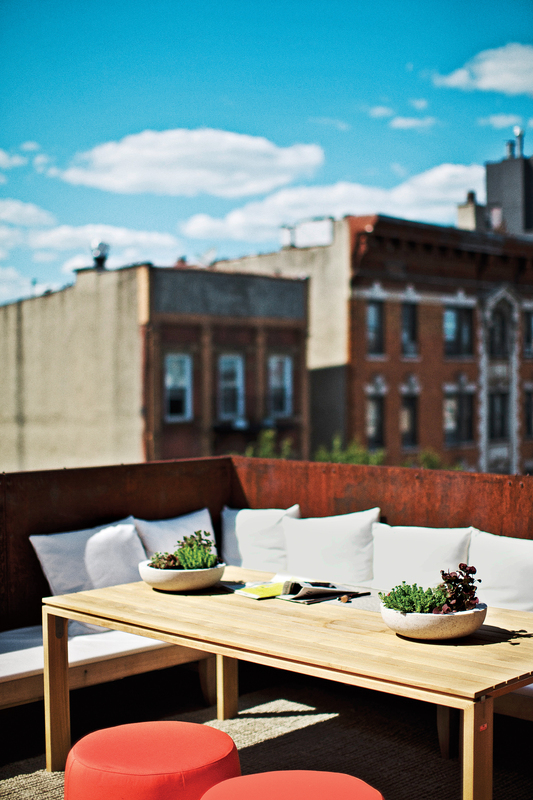 The couple worked with landscape firm Staghorn Design Studio for the plantings on their rooftop terrace, where an Elan dining table from Design Within Reach. A barbecue from Alabama Joe’s is much used in the warmer months. There was no long-term plan—no master vision— in play when Alex Gil and Claudia DeSimio rented a 500-square-foot railroad apartment on the third floor of an old tenement building in Williamsburg, Brooklyn, in 2004. Gil, an architect, and DeSimio, who works in finance, were motivated by pure pragmatism: They needed to flee an apartment in a bland midtown Manhattan high-rise that simply cost too much. But it wasn’t long before the couple started getting ideas. What if they bought the apartment, they wondered? They daydreamed about installing a Murphy bed as well as a couch and a dining table, all of which would fold into the walls to create an experience that, in Gil’s imagination, would be like “living on a ship.” One of the two landlords wasn’t willing to sell the apartment, but, as it happened, the other offered Gil and DeSimio his share of the building. The couple took over the neighboring apartment, and Gil set about designing a whimsical two-level duplex. The wall separating the two railroad apartments would be torn down, creating a 1,250-square-foot space, with a bathroom and a combined bedroom and dressing room set off from an open area for cooking, eating, and entertaining. The public space would be dominated by three striking monolithic forms: a 12-foot-long red-cedar dining table that Gil designed to resemble a block when its four chairs and two benches are tucked in; a triangular “wedge core” that houses the common stairwell; and the steps that lead to a 750-square-foot rooftop addition with a second bathroom, a living room, and a 300-square-foot deck. Gil and DeSimio encountered their first real roadblock when New York City’s Department of Buildings ordered them to install an elevator, widen the stair-well, and make other modifications to bring the building in line with the city’s 2012 building code. DeSimio responded by combing the municipal archives for tax records, maps, and photographs—an exhaustive process that paid off when she established that the building had been constructed no later than 1887, under the city’s oldest tenement law, and therefore could legally do without an elevator and other modern adjustments. Their sense of the building’s history was further informed by the demolition process. They stripped one layer of drywall to find another covered in graffiti, a remnant from a period of dereliction and abandonment in the 1970s and 1980s. Removing that layer revealed the original brick, a pair of fireplaces, and echoes of the floor plan from a 1910 blueprint DeSimio had discovered. 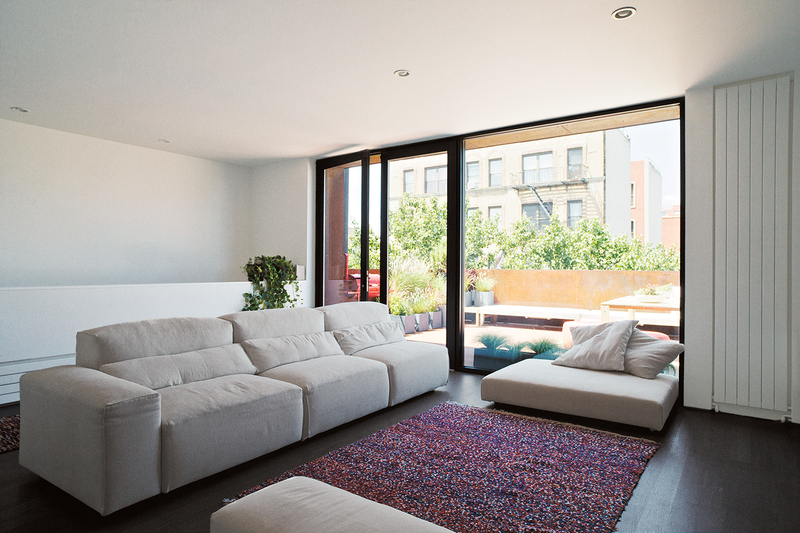 “You could see the layout, and how small the original living spaces were,” she says. Buttons, a needle, and a delicate pair of filigree scissors were unearthed near a front window, suggesting that a long-ago occupant kept a sewing table there. A penny was found that, when rubbed clean, revealed a date of 1865. The virtual opposite happens at night, when it’s time to walk past the ascending wedge core and down a short corridor to the bedroom, which, with its lower ceiling, black walls, and antique furniture, was conceived as a smaller, cozier space. Upstairs, ample sunlight pours through a plate- glass window and a glass door, playing off the white walls, couch, and cabinetry. Inspired by a visit to the Alhambra, in Granada, Spain, DeSimio busied herself during the construction process by handcrafting more than 6,000 seashell-shaped tiles for the upstairs bathroom that she bisque fired and airbrushed to a light- and dark-blue sheen in a 24-hour ceramic studio in the neighborhood. The rooftop addition is strikingly brighter than the main level, where the narrow tenement windows and the gray stain on the white-oak floorboards contribute to a more sedate feel. In part because they weren’t shy about getting their hands dirty—running their own Internet cable, for example, and repainting some of the interior walls themselves—Gil and DeSimio were able to complete their new duplex for about $120 per square foot. The addition—home to the couch, bookshelves, and television—has a more lived-in feel than the lower level, which is more sparse and, Gil and DeSimio acknowledge, perhaps not to everyone’s taste. But it suits them.